I brought very little fabric with me to Shanghai, so one of the first things I wanted to do here was to scope out the fabric markets. The more famous of the two biggest fabric sources in Shanghai is the South Bund market, but after some online research, I decided to check out its rival, the quieter and apparently less expensive Shi Liu Pu market, first. Both markets offer made-to-measure tailoring services and sell fabric by the metre. There seem to be four floors at Shi Liu Pu, including the basement (the place is a bit of a labyrinth). There’s also a large area out the back of the second floor with a wider selection of wool and heavier fabrics. The market has an amazing range of silk, linen and cashmere, and there are several stalls which focus on denim and on jersey/knit fabrics, but there is very little cotton (that I could see). I tried to research prices online to get some idea what I should start from when haggling (I’m a terrible haggler) but the only notes I could find were on a 2011 forum post. So, I’ll include what I paid for the fabric in case anyone out there needs a more recent reference BUT bear in mind that I don’t speak Chinese yet and that really has a big impact on the price. 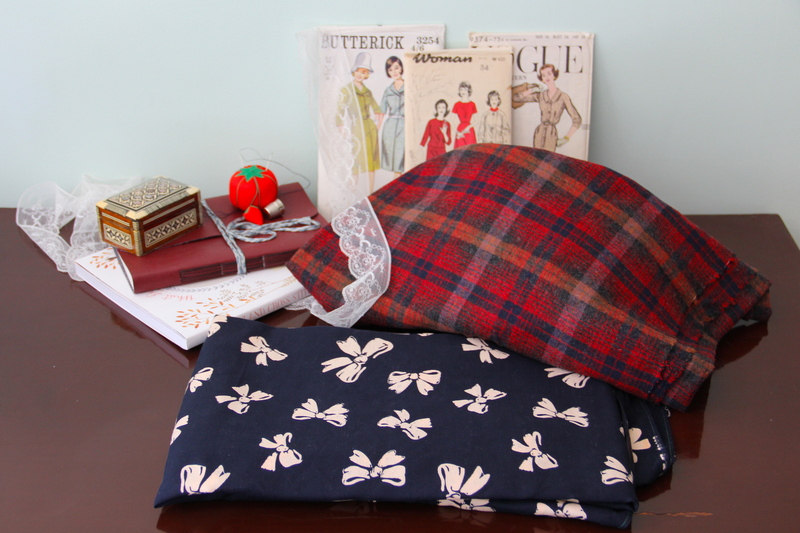 The plaid wool (medium weight, 40 yuan/Eur5 for 1m) shown in the top photo is destined to become a nice warm Delphine skirt, though I’ll have to source some lining first. The bow fabric beside it(2.5m for 80 yuan/Eur10) feels like a soft viscose/cotton blend and has a lovely drape, so could be good for another Myrtle, once I get a printer up and running for the ol’ pdfs. The red jersey knit and the rose-patterned heavy ponte were each 90 yuan/Eur12 for 2m, and the floral viscose was 50 yuan/Eur6.50 for 3m. On the one hand, I’m sure the prices will come down when I can actually negotiate in Mandarin and not just via a calculator app, but on the other hand, everything came in much lower than I expected and at prices I was happy to pay. I also made a quick trip to the notions market (one thing about shopping here is that so many stores and kiosks seem to be very specialised – so the fabric stalls generally only sold one or two types of fabric, and they didn’t sell any notions. 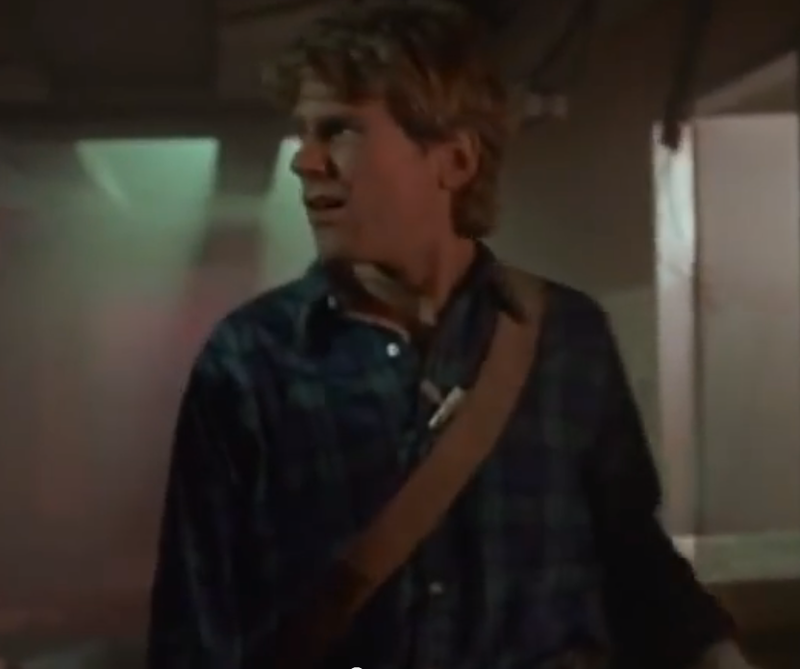 In the notions market, generally the guys who sell zips only sell zips, or the button guys only sell buttons etc). 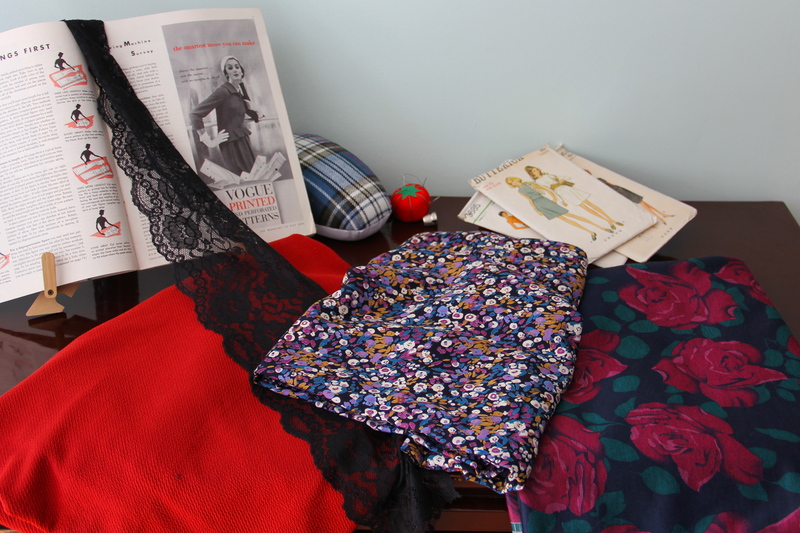 At the notions market, the white lace and the wide black stretch lace in the photos above were each about 5 yuan a metre, and I bought a mixed bunch of a dozen invisible 22″, regular 22″ and short zips for 10 yuan. Shi Liu Pu is on the corner of Dongmen Road and Renmin Road: take the metro to Yuyuan Garden, exit onto Fuyou Road and go east along that street until you hit Renmin Road. Go south on Renmin Road until you get to the junction of it and Dongmen Road (the market is a huge warehouse and it has a big sign on it at that corner with the name in English). It’s a 15-20 minute walk from the metro. The notions market is on Renmin Lu: metro to Yuyuan Garden, take the exit for Renmin Road and head east along that road (it’s around 388 Renmin Lu, close to South Sichuan Road). It’s a 10 minute walk from the metro. So, I managed to make a complete mess of the hem – it was really puckered and the back of the stitching was all kinds of odd. 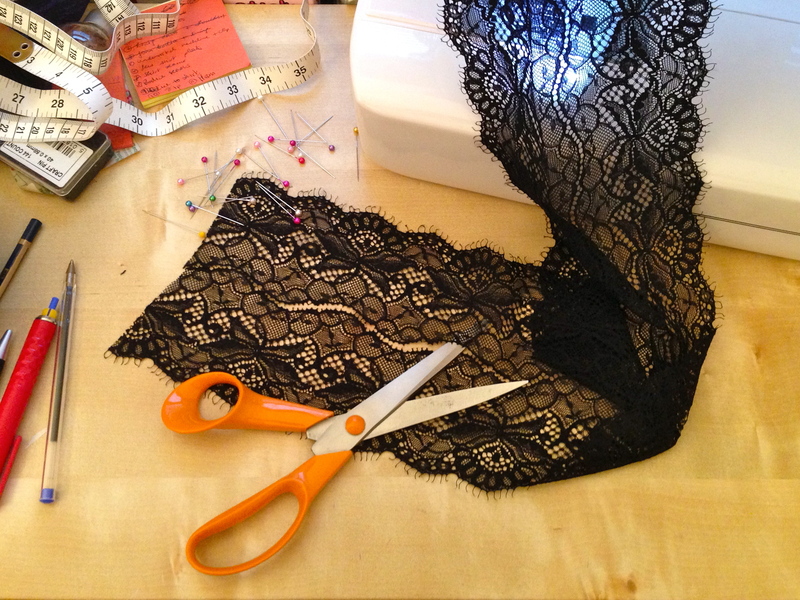 I didn’t want to cut the fabric and lose the length though, so instead I scouted out some lovely stretch lace from a haberdashery in the Powerscourt Centre, A Rubanesque. She didn’t have enough of the lace I’d picked out left in stock, so instead she suggested cutting this really wide one in half, which worked perfectly for making a nice wide band of lace. It feels like cheating a bit to basically put a band aid over what is a truly disastrous hem, but I quite like how it turned out! I’m not sure how I could have rescued it otherwise, without cutting up the skirt and re-doing the hem with a new twin needle. As it is, I really like this dress and have already worn it several times. 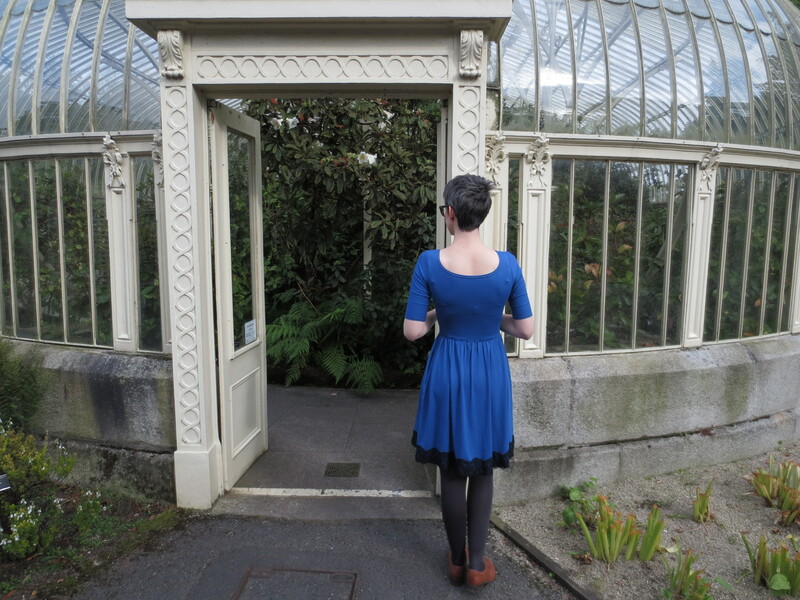 The bamboo jersey is a lovely bright blue and is really, really soft, and the lace adds something a little delicate to what would have been a very simple dress. 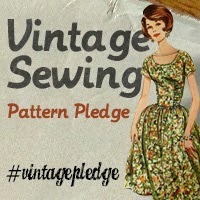 Have you ever done an emergency patch-up or patch-over on a sewing project? How did it turn out? 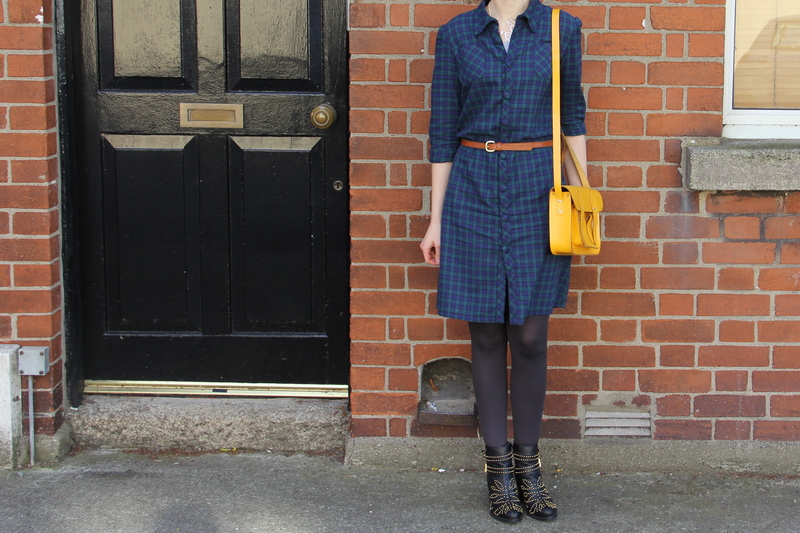 I’m trying to experiment a bit more with sewing different types of fabrics these days, so I was really intrigued to see that the newest release from Colette Patterns – the Myrtle dress – was designed with both knits and wovens in mind. I actually bought some lovely patterned jersey in London recently to pair with this pattern, but thought I’d give it a first run with a woven. This lovely soft viscose comes from Murphy Sheehy in Dublin (I bought it several months ago but they might have a bit left on the roll). 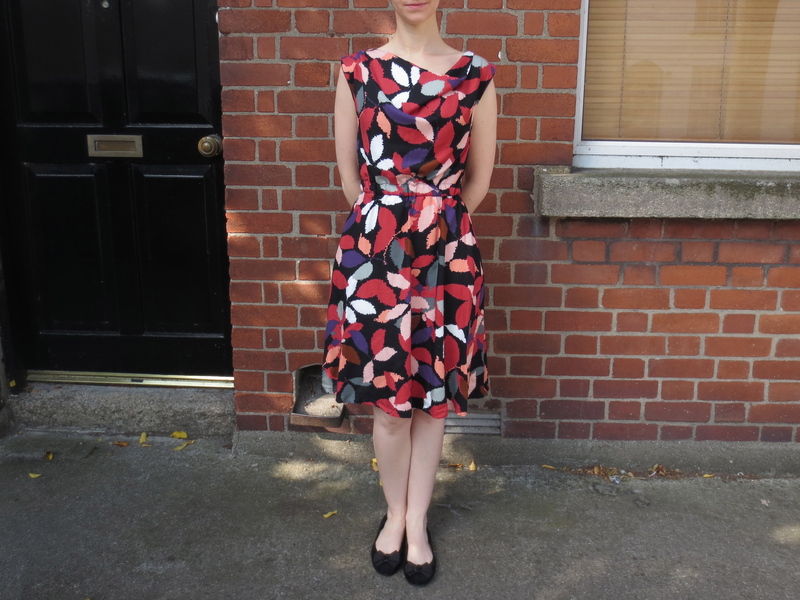 The fabric was so nice to work with – sewing without slipping, ironing easily, draping nicely. The Myrtle pattern is quite simple, but I did find the shoulder section a bit fiddly. 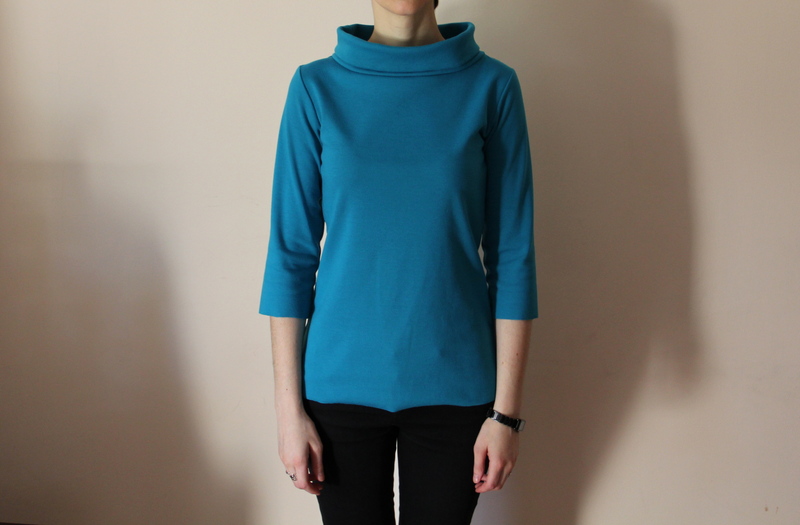 The front piece is self-lined and is basically one long piece folded over at the neckline to make the cowl. When sewing up the bodice seams, you do so with the back bodice piece sandwiched between the other bits. The pattern’s sewalong was really helpful, but I still wasn’t quite sure how the back part was supposed to look when lined up for sewing. In the end, I had a bit more back neckline peeping out above the shoulder seam, so I just turned it under and stitched it down afterwards. Sewing the elastic casing was also a bit fiddly, but am sure I’ll get much quicker (and smoother!) at it with practice, so am planning a few more Myrtles already! I’d really like to make the knit version now, and it could be make for an interesting comparison with the way the woven one comes together. 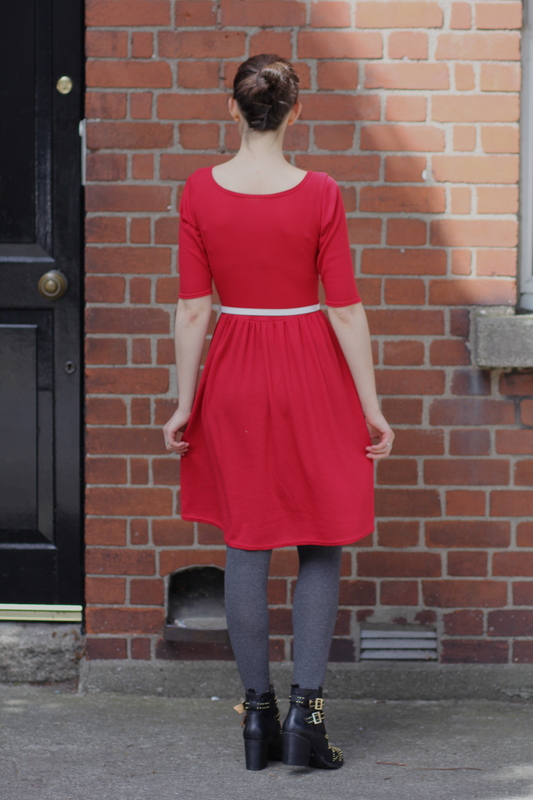 I was a bit more generous with the length of elastic than the pattern suggests for the waist: the elastic I have is quite sturdy and although there’s great stretch in it, it doesn’t give too easily and I didn’t want to be constricted in an otherwise very comfortable dress. Have you come across any other lovely knit-and-woven patterns I should check out? Or have you tried Myrtle in a knit fabric? A few months ago, Colette Patterns announced plans to jointly release new knit patterns alongside a book dedicated to sewing knit fabrics. They also offered an opportunity to sign up via email and receive a free preview chapter of the book shortly prior to the launch date, so I quickly signed up and waited to see what the book would hold. That one chapter convinced me that the book, The Colette Guide to Sewing Knits, would be an invaluable resource when learning to sew a wider range of knit and jersey fabrics. I feel I’ve gotten off to a good start by sewing a whole bunch of Coco tops and dresses (pattern by Tilly and the Buttons), but have really wanted to get stuck into sewing a broader variety of knit fabrics. I don’t have an overlocker or serger though, so have been really reluctant to give them a try. 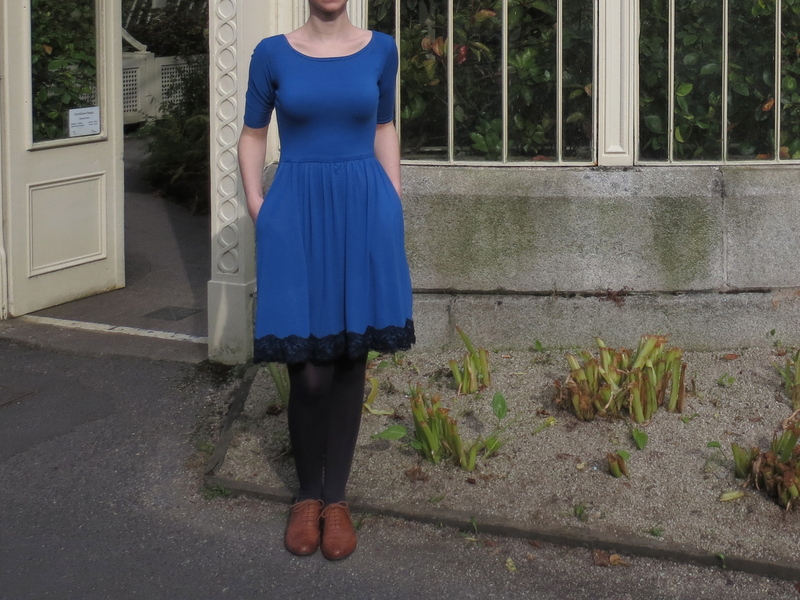 After Colette released the new knit patterns, I quickly made up the Mabel skirt in some leftover ponte, but had to wait a bit longer before tackling the Moneta dress as it was impossible to find plastic elastic in Irish sewing stores (between dropping in and looking online, I checked over a dozen shops but just couldn’t find the right elastic!). I had held off from ordering from overseas as the postage was higher than the price of the elastic (!) but I finally ordered it from Minerva and it was delivered really quickly. This fabric is a red baby rib knit from MyFabrics.co.uk which I spotted on sale while waiting for the Colette package to be released, and took a bit of a gamble on it (it looks like it’s sold out by now). I also used some of that remnant light jersey polka dot fabric from my night Coco for the side seam pockets. I’m not sure whether the red fabric is slightly too light for this project or if my stitch settings were off, but I had a really tough time sewing the plastic elastic in to the waist to shirr the skirt before joining it to the bodice. 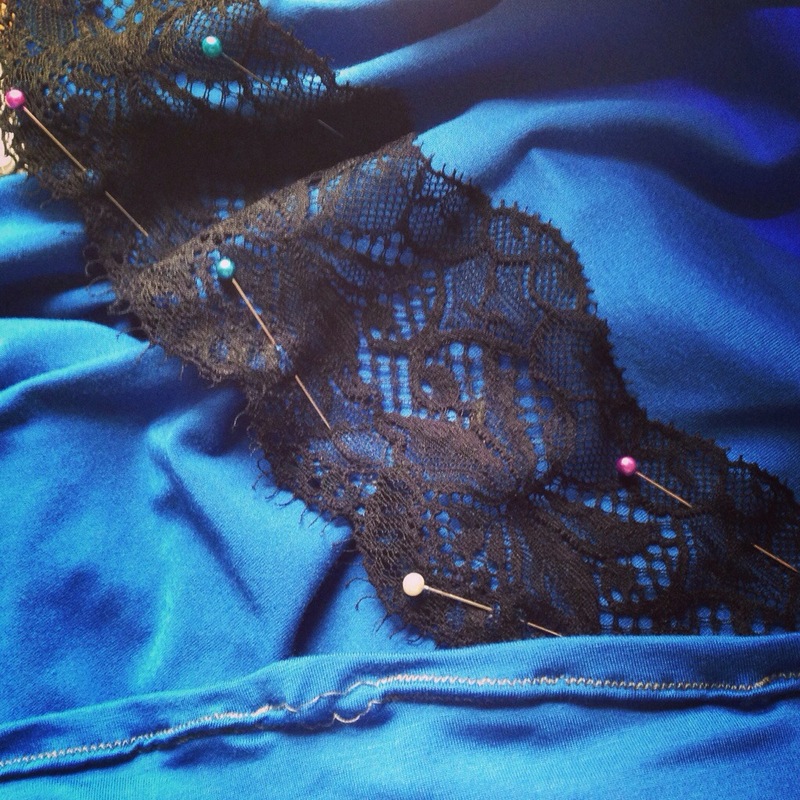 I felt like I needed at least one more hand to pull the elastic and fabric through behind the needle while keeping the elastic – but not the fabric – stretched in front of the needle. I tried different stitch combinations but the elastic was frequently pulled in to a tight tube shape as I tried to attach it. Eventually I sent a plea for viable alternative methods out over Twitter, so I have some different techniques to try the next time around! I did persevere with this technique though and managed to get the elastic in as per the pattern instructions, but it looks like a sewing machine vomited on the inside of the waistline. The one thing I really did fall in love with while making Moneta was my new twin needle. I had debuted one already on Mabel, but I felt that maybe the needles were slightly too close together (2.5mm) for a smooth finish so I bought a second one (4mm ‘twin stretch’). This rib knit is prone to fraying but by turning up raw edges by 1cm and stitching at 3/8″ (sorry for mixing the measurements but that’s how I really worked instead of converting everything to the same unit! ), the zigzag formed behind the twin stitching perfectly caught and sealed the edges. 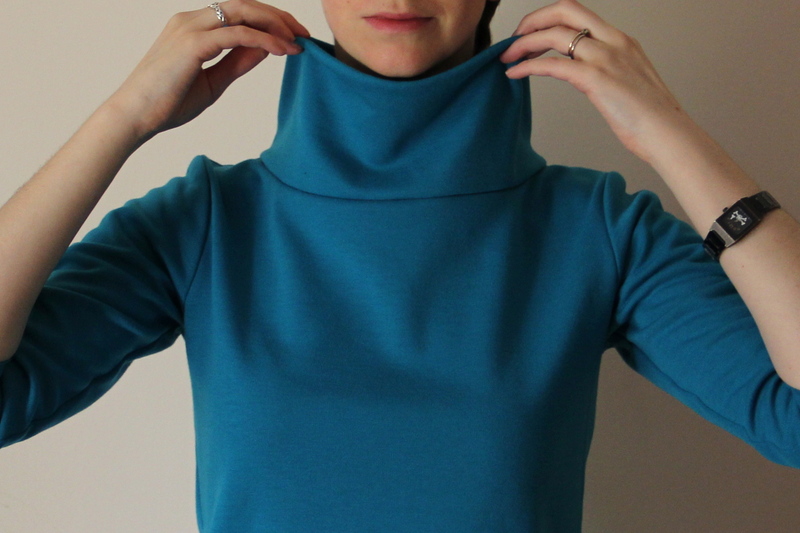 The 4mm double needle definitely gives a nice smooth finish to hems and necklines – this neckline turned out much smoother than using a zigzag on my Cocos pre-double needle. Recommend pattern? : Shirring issues aside, this was a really quick project and I’ll definitely be scouting out some nice knits to make more. I’ll explore alternative methods for attaching the skirt, or might be able to source some wider plastic elastic online in the hopes that it will be less likely to ‘tube’ than the width called for in the pattern. 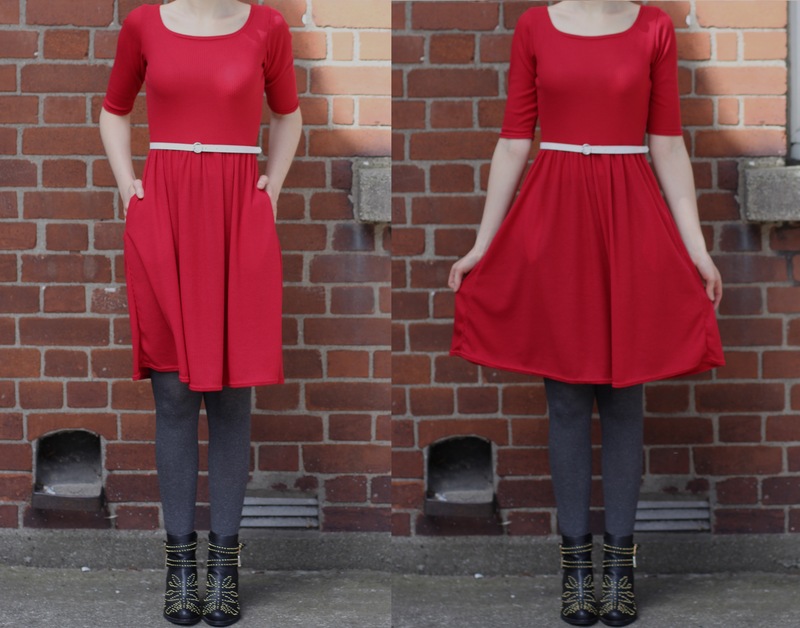 I have a heap of this red knit left over so I might try some of the collared varieties of Moneta, but make it into a top instead.